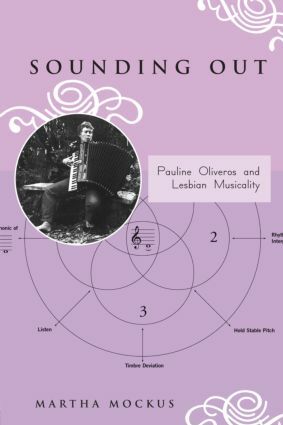 Sounding Out: Pauline Oliveros and Lesbian Musicality examines the musical career of the avant-garde composer, accordionist, whose radical innovations of the 1960s, 70s and 80s have redefined the aesthetic and formal parameters of American experimental music. While other scholars have studied Oliveros as a disciple of John Cage and a contemporary of composers Terry Riley, Lou Harrison, Gordon Mumma, and Robert Ashley, Sounding Out resituates Pauline Oliveros in a gynecentric network of feminist activists, writers, artists and musicians. This book shows how the women in Oliveros’s life were central sources of creative energy and exchange during a crucial moment in feminist and queer cultural history. Crafting a dynamic relationship between feminism and music-making, this book offers a queerly original analysis of Oliveros’s work as a musical form of feminist activism and argues for the productive role of experimental music in lesbian feminist theory. Sounding Out combines key elements of feminist theories of lesbian sexuality with Oliveros’s major compositions, performances, critical essays, and interviews. It also includes previously unpublished correspondence between Oliveros and Edith Guttierez, Jill Johnston, Annea Lockwood, Kate Millett, and Jane Rule.